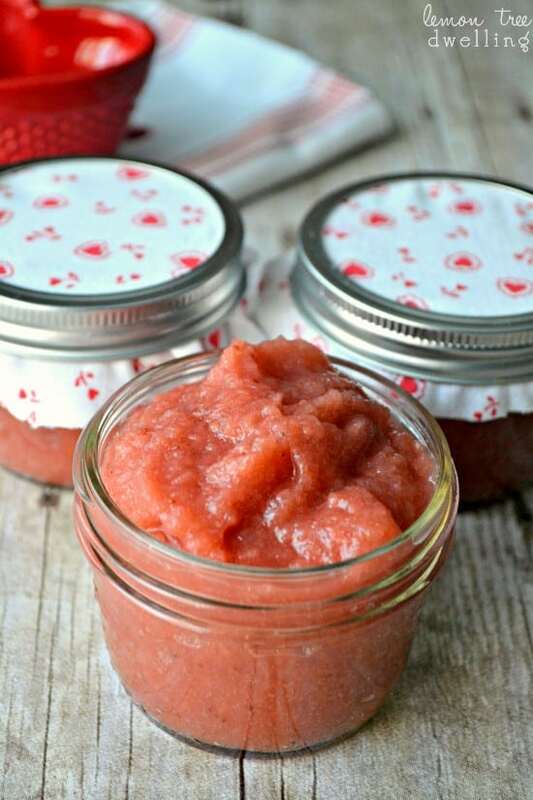 Fresh, Homemade Strawberry Applesauce is made with just 5 ingredients and makes a delicious quick snack. 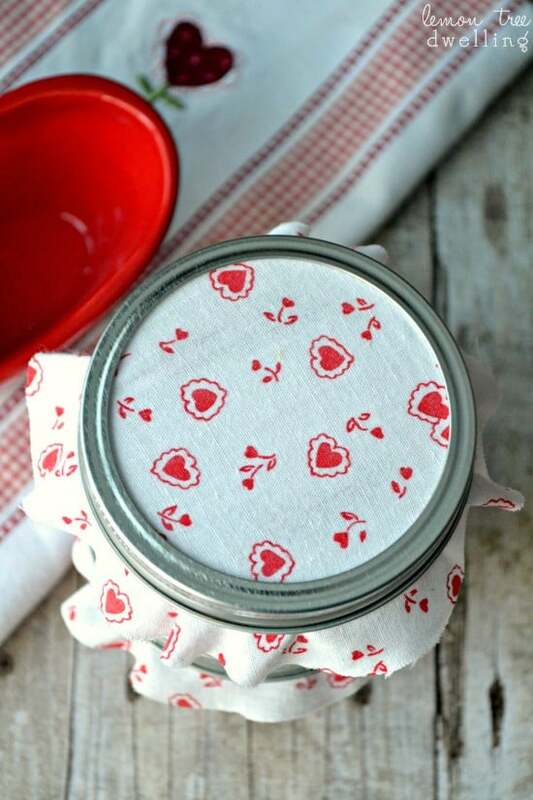 This healthy treat can be wrapped up and given away for Valentine’s Day! Happy Monday, my friends! Can you believe it’s already February 3rd!? It feels like January flew by….and now Valentine’s Day is just 11 days away! We love holidays around here, and especially smaller holidays like Valentine’s Day. There is something so refreshing about having a reason to celebrate…..without all the stress of gift giving! Instead, we can focus on having fun baking, crafting, decorating, making and giving simple valentines, having a nice family dinner, and indulging in way too much CHOCOLATE!! Of course, when you grow up like I did, holidays just aren’t holidays without ANY presents……(my mom STILL gives us little Valentine’s Day gifts! )……so you better believe there will be some presents exchanged. The girls will each wake up to a special little something waiting for them at the breakfast table, Jorden and I will get each other something small, grandmas and grandpas will be surprised by something handmade by the girls, and we’ll definitely remember our neighbors and teachers with a fun little (edible) gift! I know Valentine’s Day is usually about chocolate…. 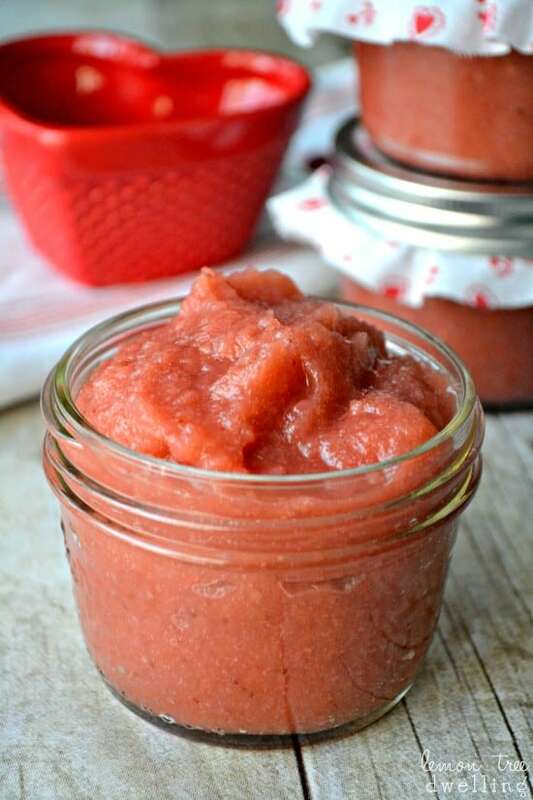 (and don’t worry – there will definitely be plenty of that to go around)….but this year I’m thinking about Strawberry Applesauce! 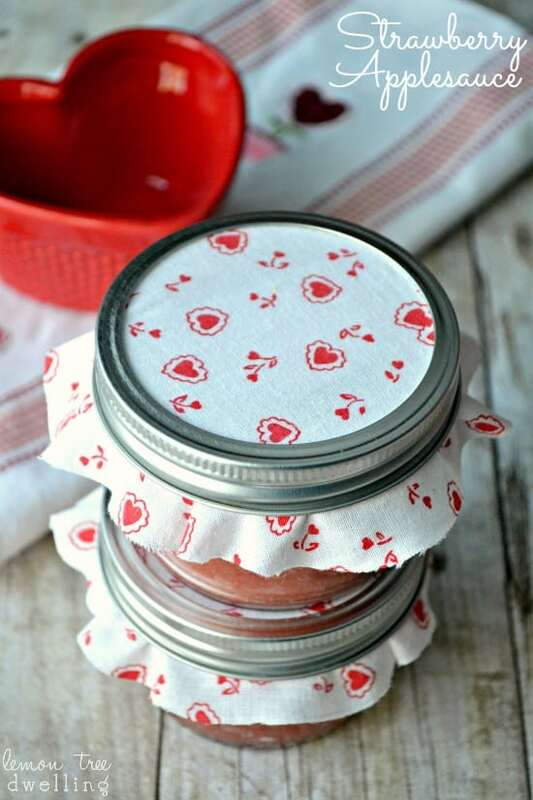 It’s sweet, delicious, PINK, and so easy to make and package up as a little gift! With one or two batches, you could have everyone covered….and maybe even a little left over for yourself. Which is good, because there’s no way your kids will see this going out the door without wanting (or demanding) some for themselves!! And it’s something you can feel GREAT about giving them. What about you? What do you love about Valentine’s Day? What do to make it feel special? And what are your favorite gifts to give?? Combine all ingredients in a large saucepan and bring to a boil. Reduce heat and simmer 10 minutes or until fruit is soft and you are able to mash it with a potato masher. Transfer applesauce to a blender and blend until smooth. *I originally shared this recipe at The 36th Avenue. This looks so pretty, and I know it is delicious. I love this idea for something a little different for a teacher or friend! As always, super cute idea Cathy! Love it! That looks delicious! Growing up my mother would always give up a bar of chocolate or something small for Valentines day. I do the same for my son. We usually go out to dinner or get take takeout. It’s pretty low key for us. I’ve never made applesauce because I never realized how easy it is! Wow! 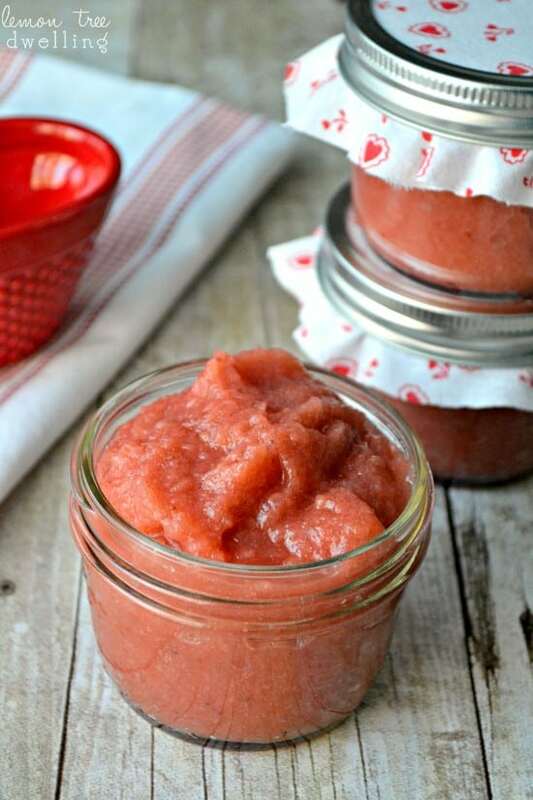 Oh my goodness Cathy, my kids LOVE strawberry applesauce from the store – I’ll have to try this version, it looks so good!! love this idea! Love that it contains none of the artificial sweeteners that store bought strawberry applesauce contains! Checking this out row ducks n a row link party and I pinned this! Really looks good, but I would use Sugar in the raw, it is Gluten Free. I would just make it all the time not just for Valentines day. this looks delicious!! I’ve never mixed applesauce with strawberries! This looks good. 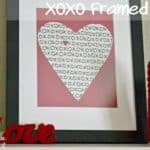 Perfect gift not only for Valentine’s Day but for any occasion. I agree! Thanks so much!